Can I color my hair before my wedding day? Your can color your hair before your wedding day, but it is best not to wait until the last minute. Schedule an appointment at our hair salon in Plymouth MI for a new hair color, highlights or a touch up at least 2 weeks in advance. A haircut or trim should also be planned at least 2 weeks before. This will give your hair enough time to adjust to your new color and haircut before your wedding day. How can I make my hair shiny and vibrant before my wedding? Make an appointment for a deep conditioning treatment at our hair salon a few weeks before your wedding day. A deep conditioning treatment can help repair damage, lock in moisture, add shine, and strengthen your hair. This will leave your hair soft and gorgeous on your wedding day. How do I know which wedding hairstyle is right for me? It is best to choose a style that compliments your dress and your personality. Experts suggest that you don’t stray too far from your personal style. If your dress is simple but chic, then choose a more classic, sophisticated look. If your dress is elaborate and ornate, go for a style that has more intricate details. For outdoor weddings, you should choose a style that will hold up. Certain styles work better in humid outdoor conditions than others. 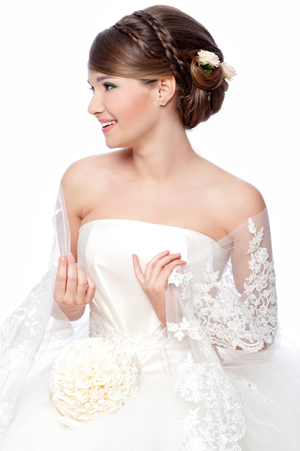 Our wedding hair experts will be happy to offer advice to help you choose the perfect hairstyle. Should I wash my hair before my wedding hair appointment? This depends on your hair type and the type of style that our wedding hair stylists will be creating for you. If you are going for long lengthy layers, you may be able to shampoo your hair on the morning of the wedding. If your hair is normal and if your preferred wedding hairstyle is an updo, then you can wash your hair the night before your wedding day. Your hair will conform more easily to the style if it is not squeaky clean. When you arrive at our hair salon in Plymouth MI for your initial wedding hair consultation, we will examine your hair type and give you specific instructions for hair care on the day of your wedding in order to allow for the best results.